In most projects, the improvement of existing IT systems and infrastructure plays an important role in increasing the efficiency of the national counterpart organization. Improving IT systems is often synonymous with the replacement of existing software by a new product and implies changes in the respective organization and its business processes. IT consultants assist clients in analyzing existing processes and systems, and in defining the terms of reference for products and services to be purchased. It is therefore indispensable that the provided service is highly competent, is not bound to a specific product in the first place, and is based on profound experience of the IT market. Moreover, consultants may also assist the organization during software implementation. The combination of different skills is crucial for the IT consulting. First, the consultant requires a detailed knowledge of the complete IT sector including IT infrastructure, hardware, operating systems, databases, standard applications and programming tools. In addition, in-depth understanding of business administration processes is required. The third component are strong communication skills, as the IT consultant has to establish an effective link between the different departments of the client’s organization, and also between the client and the software vendor. During the past ten years, GFA B.I.S. has gained vast experience in IT concepts and a detailed overview of the software market. Having experience in the industrial sector as well as in international cooperation, our concepts are both highly professional and adapted to specialized project requirements. The range of services offered by our consultants starts with the planning of the IT project in cooperation with the client. 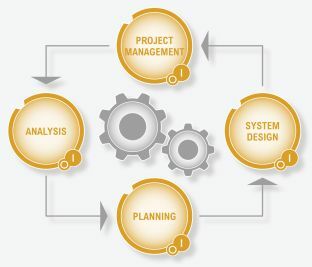 The analysis of business processes results in the concept of an optimized software design. For the design phase we apply professional unified modeling language (UML) tools like Enterprise architect®, and profound know-how in database management. Once the system design has been finalized with the client, our consultants define the Terms of Reference (TOR) reflecting a more precise documentation of the system design. We also assist our clients during the decision making and tender processes, ensuring compliance with relevant national and international rules and regulations. Once a product has been purchased, we support our client during its implementation. Our consultants take care of all required project management responsibilities such as management of costs, implementation timeline, as well as implemented features.